Pour vegetable oil into an 8’ cast iron skillet and place the skillet in oven to warm. In a medium bowl, combine cornmeal, flour, baking powder, soda, and salt. Make a well in the center of the flour mixture. Using a fork, combine the buttermilk and egg. Add the liquid ingredients to the dry, stirring just until moistened. Do not over-stir. Remove skillet from the preheated oven and pour the heated oil into the cornmeal mixture. Mix well. Do not wipe the skillet. Pour cornmeal mixture into the skillet and place it back inside the oven to bake for 20 minutes, or until golden brown. Crawford enjoys this delicious cornbread while discussing the evidence collected so far with a cat named The Black. You may enjoy it whenever the need for cornbread presents. Many thanks to Bill Fits for sharing the recipes of his uniquely Southern investigative character. 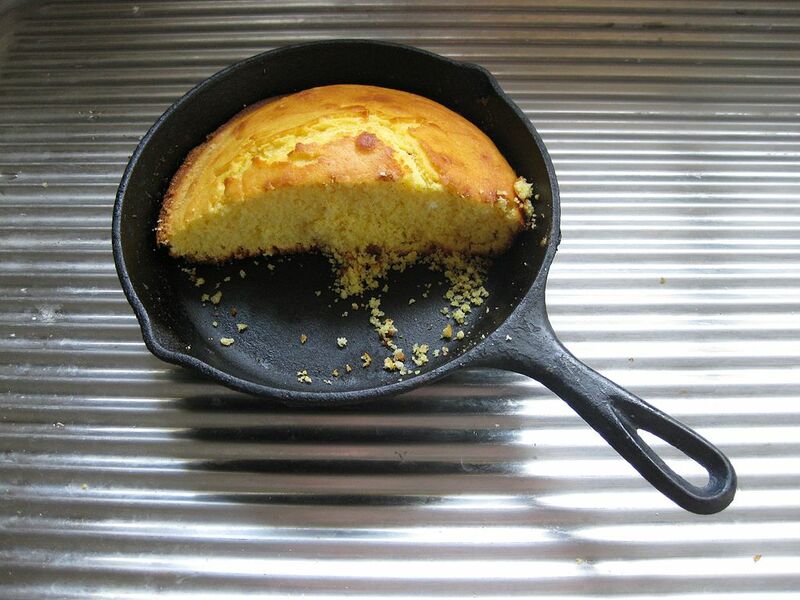 This entry was posted in Bread, Literary and tagged cast iron, cornbread, goodness, homemade, southern style. Bookmark the permalink. Janice this is so creative! What a good idea for a post subject.Thank you.☺ I also love cornbread. Would coconut oil work instead of vegetable oil, do you think? Works better for my body. I love coconut oil too. I’ve used it to replace the oil in several things. I see no reason why it won’t work here. I have used it in my Applesauce Brownie recipe with great success. Applesauce Brownies – yum! I may need to find that one 🙂 Thanks Janice. Good to connect. enjoy! We once made them 3 ways – the called for butter, olive oil, and coconut oil. All three were good, different, but good. My fave oil was coconut.. and you know, I don’t think I put that in my Note. I’ll go do that.